On the garden yield. The 2017 tomato crop has blown away all my previous yields. This was probably my heaviest harvest in August. Over 20 pounds. So far this year my grand total has exceeded 171 pounds, and the cherry tomatoes are still producing. My previous personal best was 139 pounds the first year I moved to a community garden plot. I thought that was an immense amount and now I am dealing with another 30 some pounds. The freezer is full. I have been gifting a half dozen friends regularly. The food bank and the Wine in the Garden auction basket winner have benefitted from my harvest. I keep extensive records. By variety. Number of tomatoes. Number of ounces. Every time I pick. I sort. I weigh. I process. Doing this allows me to decide what to plant again. What to give up. This year? The last of the pineapple tomatoes. They disappointed me for the last time. I love how they look, and how they taste, but they are fickle and fragile. My replacement for them. Striped German. 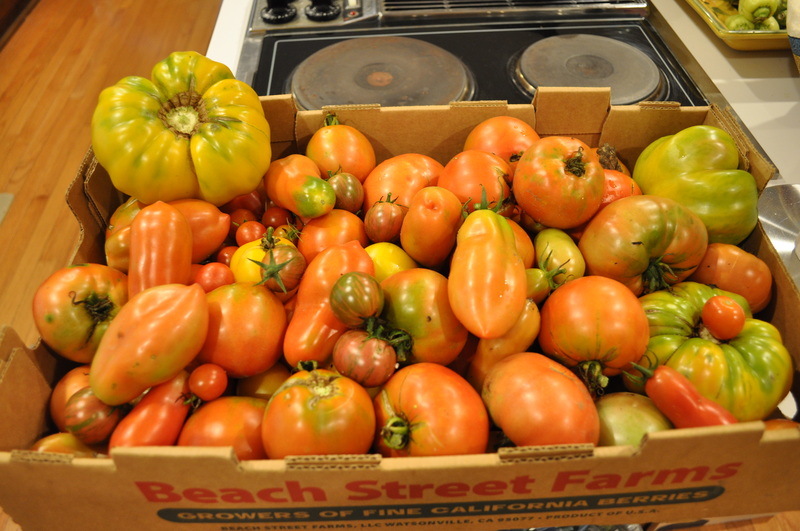 In the top picture, they are the very large yellow tomatoes with the green stripes. Those were picked a bit early, just before a predicted rain. If I left them on too long, they would split. In this picture, you can see what happens when the rains come and split the tomatoes. My other favorite from this year, the small cherries with the darkest color, are prone to splitting too. 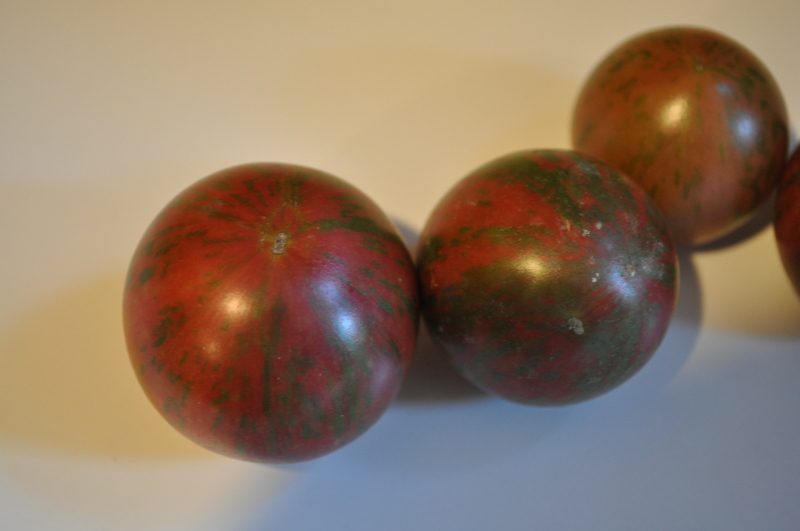 These, the black cherry heirlooms, and those Striped Germans were bought from Love Dove Farms. I bought a market pack of four Striped Germans, and two plants of the black cherries. They will most certainly be grown again next year. They were superior in taste and both produced well. San Marzano and large cherry tomatoes also did well. I had two San Marzano plants that produced more than 20 pounds of tomatoes. 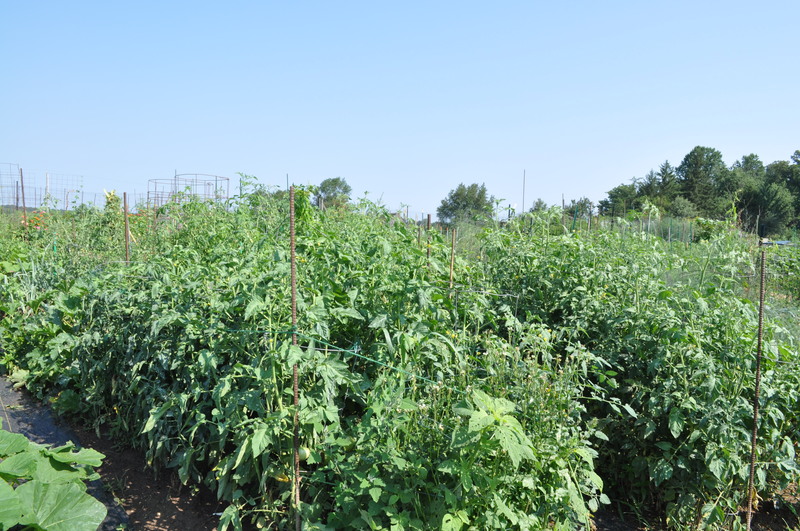 The red cherry and tomato berry plants also went crazy in late July. 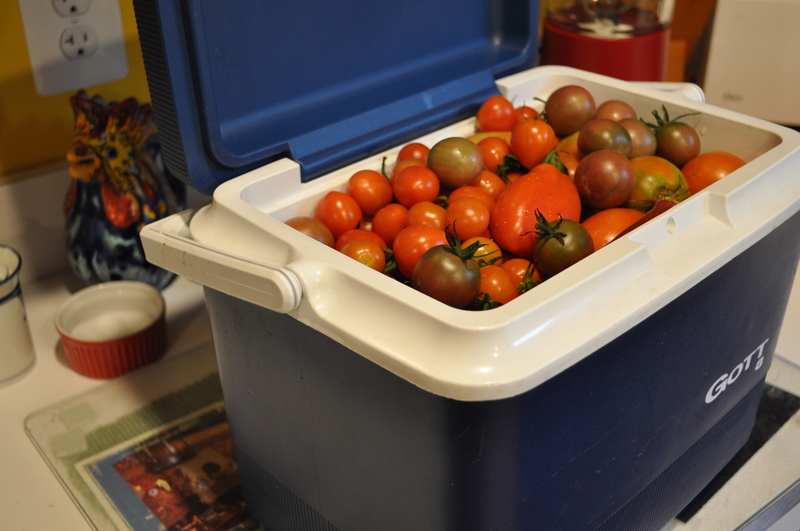 My freezer has dozens of containers of oven roasted cherry tomatoes. All winter long, I will be enjoying them over pasta or mixed with couscous or rice. I freeze them in single dinner size. Enough for the two of us to share. The plants this year were spectacular. Ringed by rebar and string to keep them upright. Many reached over six feet high eventually. I put in 32 plants this year in two long double rows in the garden. I lost two of them early in the season. Thirty plants. Averaging almost six pounds per plant. Since eight of the plants were cherry varieties, that’s a healthy return on “investment”. One other surprise. The purple bumblebee hybrid, which isn’t purple at all. Do they look purple? Not to me. They do have a great taste. Next year, they will return with the black cherry, striped German, and the San Marzanos. I will probably also repeat the Brandywine and the Rutgers. It may be the end of the season, but the planning never stops. And, let’s see if I can get to 175 pounds before the first frost. Posted in Farms, Food, Gardening, Hobbies, Weather and tagged farms, Food, gardening, heirloom tomatoes, hobbies, tomatoes, weather. Bookmark the permalink. Summer is just rushing by. Really high heat. Really heavy rain. Humidity. All those endearing aspects of living here in the MidAtlantic. August is here. Summer is halfway over. Thankfully. But, we have favorite activities staring us down. Like the county fair. I am working on my submissions for herbs, vegetable display, heirloom tomatoes and more. 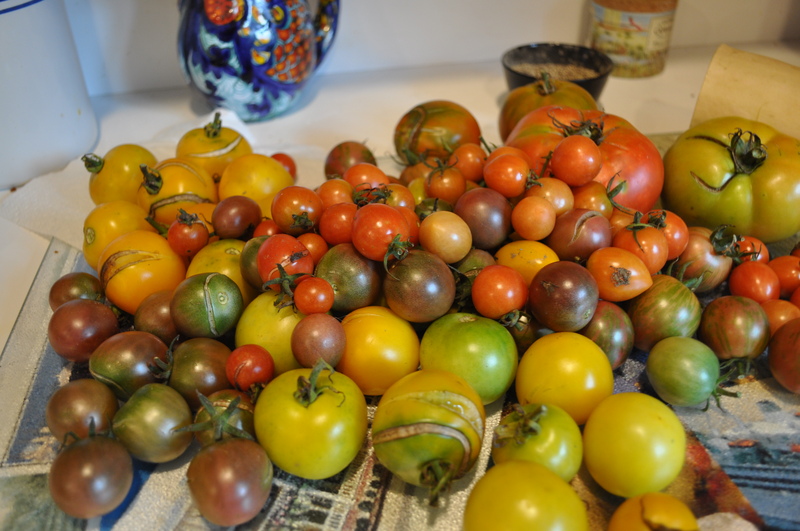 Daily visits to the garden to plead with the heirlooms to ripen in time. My calendar has more days with activities than blank days. CSA. Food bank harvest. Fair. CSA picnic. 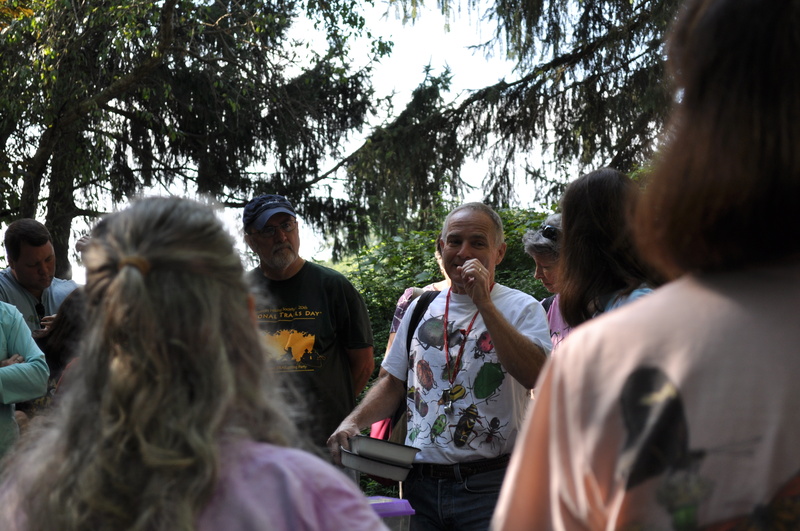 Howard County Conservancy activities, like the BioBlitz and the “Bugs, Bees and Daiquiris”. Processing the garden. 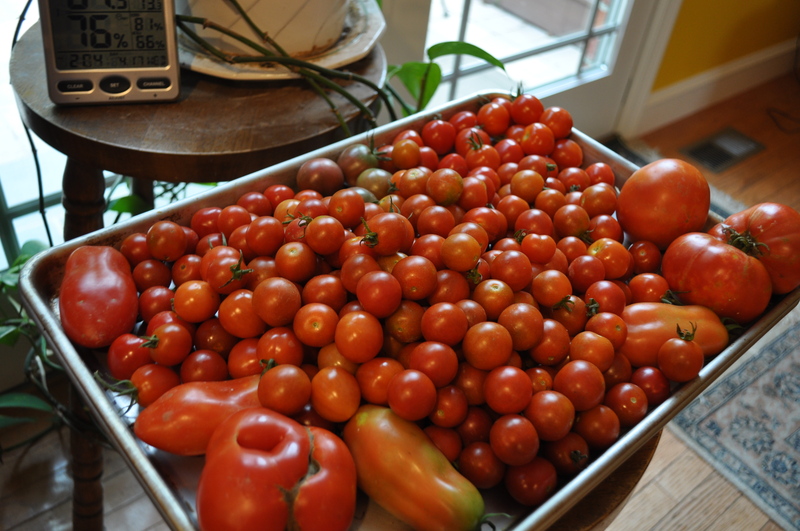 There are days when I harvest three pounds of cherry tomatoes and a couple more pounds of larger ones. Time to fire up the canning pots and get busy. Add a few family commitments and we may be in event overload. 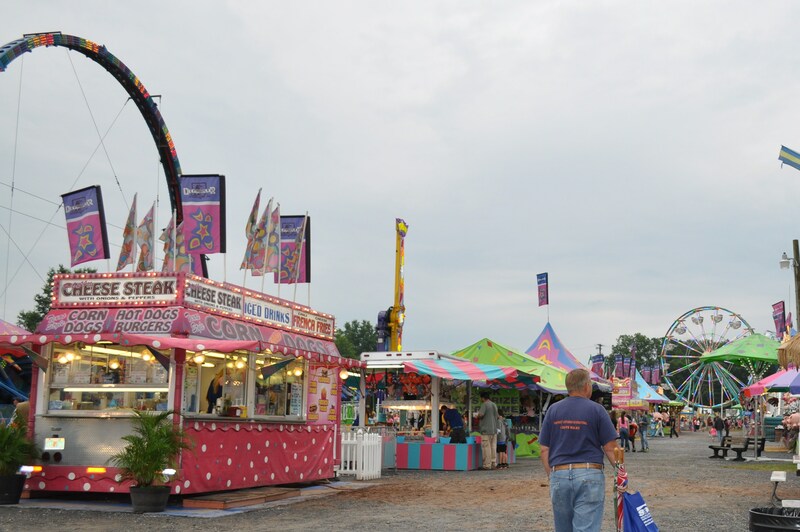 Will we see you at the fair? Or, maybe the happy hour with Mike Raupp and Paula Shrewsbury? It’s the height of summer. Enjoy it! Posted in Farms, Food, Gardening, Howard County, Local Businesses, Volunteering and tagged farms, Food, Howard County, howard county conservancy, local businesses, tomatoes. Bookmark the permalink. A new addition to my writings. To entice me to sit down more often and write. When we get too busy to take the time to pursue our hobbies that bring us pleasure, we sometimes need to stop and smell the flowers again. I will try and post at least twice a week. Those Tidbit Tuesdays, and these. Discipline. It’s what I need to come down to the computer and write. I have a long in process post about the trivia behind amateur radio Field Day. I will get it done and posted soon, I hope. In the meantime, some tidbits from the past few days. Not excited, am I? For 18 months, we mourned the absence of our favorite food writer, who helped me grow this site by linking to it and letting me guest post on the most comprehensive local food scene blog in Central Maryland (and beyond). His toddler had him way too busy to write (and curtailed his frequent visits to the local restaurant scene). It’s good to see him back and writing about what is new and exciting in Howard County. 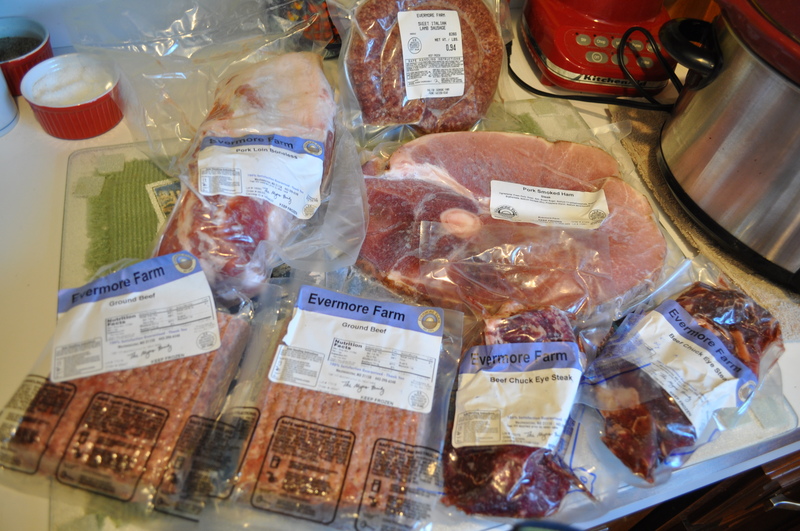 In other news, I have just finished my first four month subscription to a meat share CSA, with Evermore Farms, and loved it so much I am renewing for the next four months. I like getting this monthly surprise bundle. Keeps me creative in the kitchen. Like today. My small share. 7-9 pounds of meat a month. I also get a chicken share. Today’s bird was 5.25 pounds. I also chose to get two dozen eggs a month. The right size for the two of us. I supplement the share with a few items from the freezers at the farm. I do have the option of getting a “delivered” share, to be picked up at the Columbia Wegmans every month, or to have home delivery, which requires leaving a cooler outside. 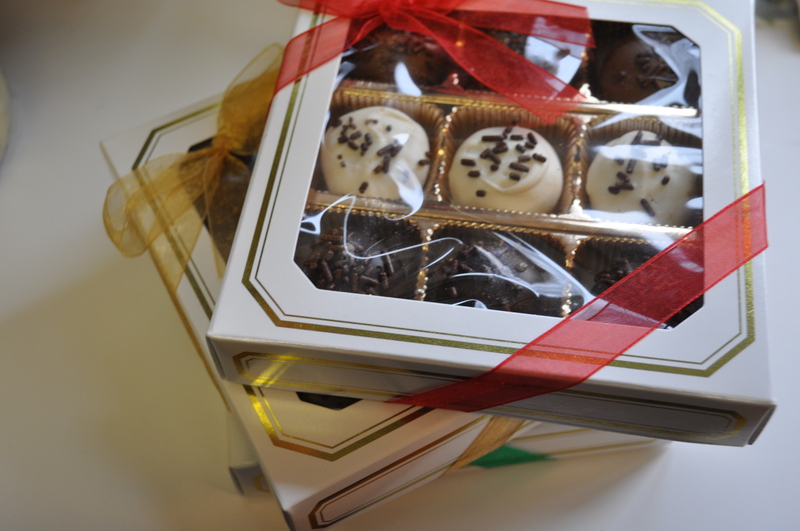 I like going to the farm, picking out a couple of extra items (including Rheb’s truffles and Salazon chocolate). Today I did get two skirt steaks to grill. This month was heavy on the grilling stuff. Beef patties. Sirloin steak. Lamb sausage. It’s a good mix of beef, pork and lamb. There are some ham “chips” which are just screaming for me to use in a traditional Maryland style crab soup. When I make it, there will be pictures. And, the last tidbit today. What is it with the wind out there. 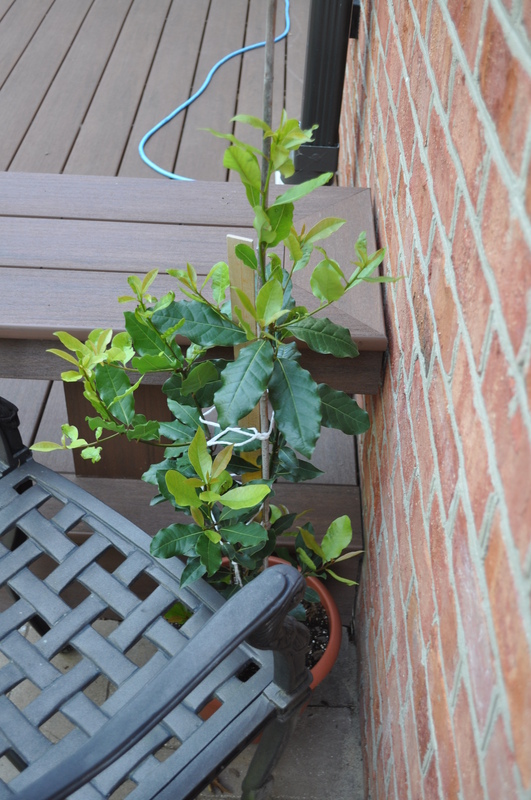 It knocked over my potted bay leaf plant twice so I had to rescue it in order to keep it safe from breaking. I had to wedge it in between the patio and deck. It has all kinds of new growth on it, and it is getting unwieldy. I need to transplant it again to a bigger heavier pot. 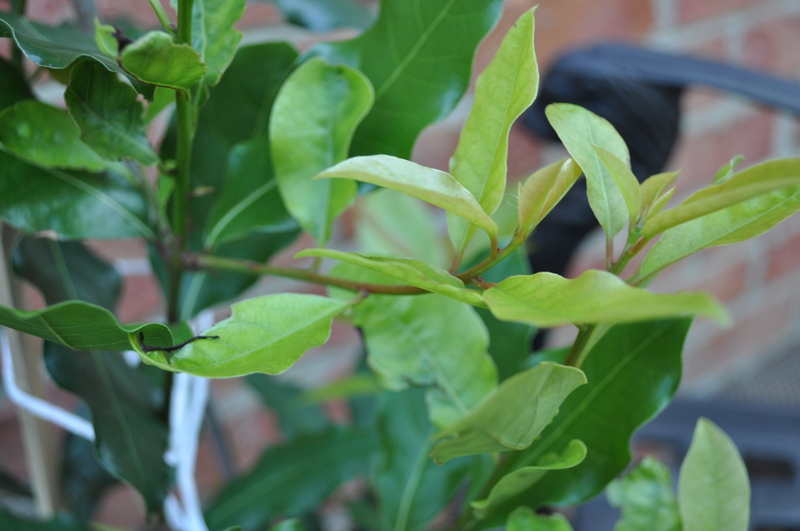 That does make it difficult to bring inside for the winter but it’s worth it to have fresh bay leaves for soups and stews. Time to stop writing here and get back to answering emails on the community gardens page. Now that’s a whole other topic I could write volumes about. Posted in CSA, Farms, Food, Gardening, Locavore and tagged cooking, farms, Food, gardening, hobbies, local businesses, Locavore, real food, weather, wegman's. Bookmark the permalink. I really miss having a weekly food delivery service, that provides me with locally sourced pasture raised meats. 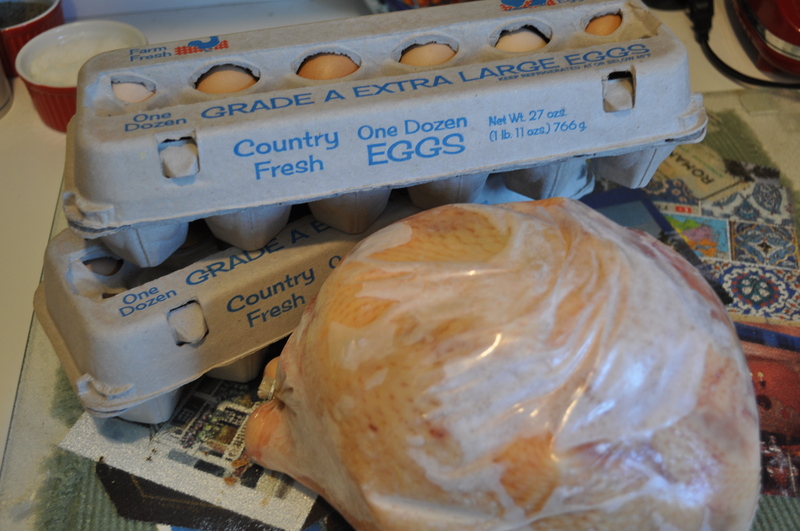 When we lost Friends and Farms, and the reasonably priced option of meats from Wayne Nell in PA, I scrambled while looking for an alternative that gave us something that flavorful, without costing a large amount of money. Simply put, excellent quality in pasture raised meats isn’t inexpensive. I discovered Evermore Farm in a roundabout way. I saw their post before Christmas featuring Rheb’s chocolates. They were located not far from one of my favorite year round farm stands, Baugher’s in Westminster. We took a trip out there, met the owner, and became a fan of their products. 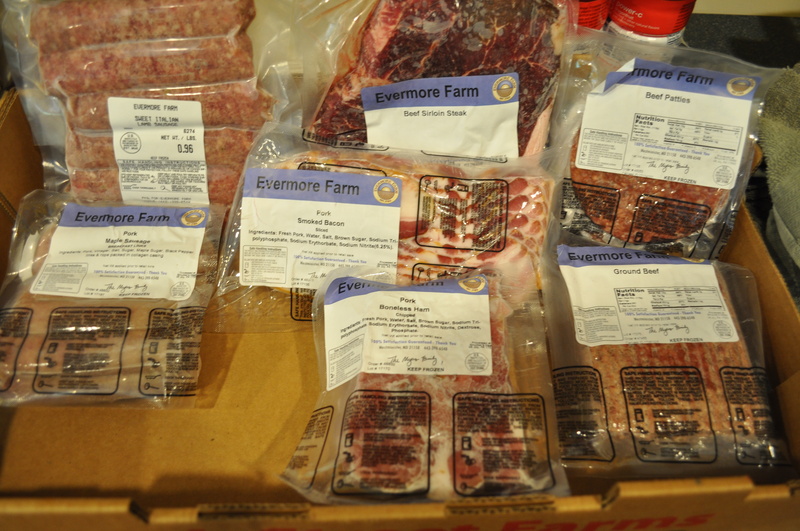 Their beef, pork and lamb were competively priced, and they were an outstanding product. 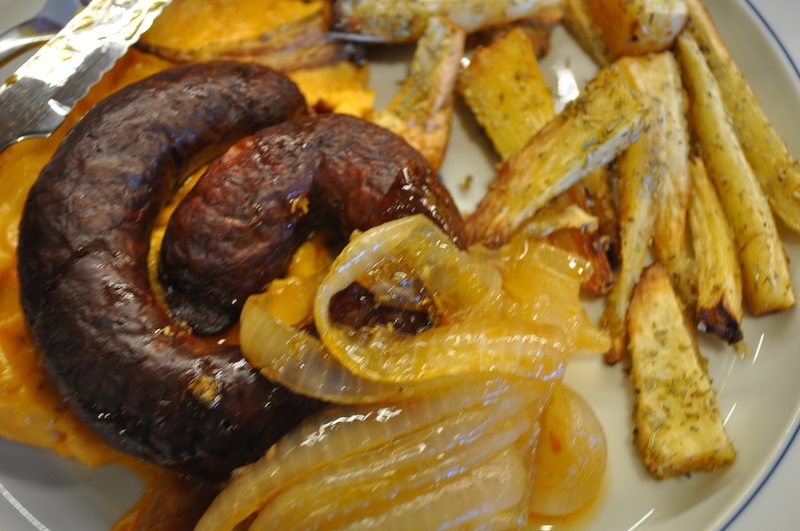 Love their lamb merguez sausage. Fast forward to the announcement of their CSA, a four month program, with small, medium and large shares. An option to buy chicken, and eggs. Delivery or farm pick up. I signed up too late for delivery, so we headed out to the farm for our first small share pickup. A good size for two people. 8-9 pounds of meat a month. Roughly $8-9 a pound, with much of what you are getting the more expensive cuts of meat, so it is worth the cost. Not long after joining this meat CSA, we see that another favorite source, albeit almost as far away from us, Copper Penny Farm, is now offering a meat CSA. Two sizes. Small is 12 pounds and large is 25 pounds a month. A bit more than we would likely use, but a very good value for a family. They also have an egg option. 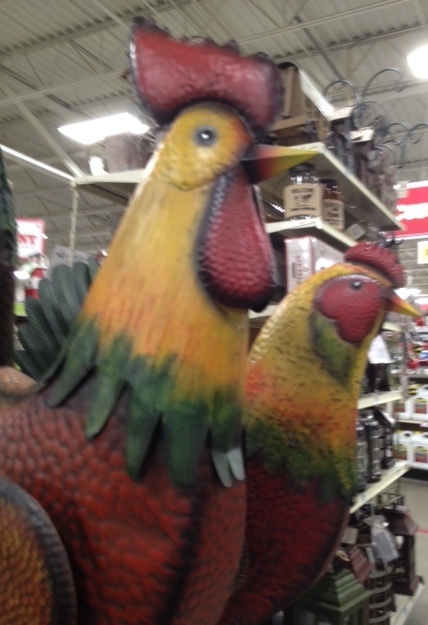 For us, we did add the poultry and egg option from Evermore. We could have chosen three dozen a month, but two dozen is perfect for the two of us. I have already planned my monthly trips. Next month, pick up CSA and hit Baugher’s for vegetable plants for my community garden. June, pick up CSA and head to Old Westminster Winery for my quarterly wine club pick up. July? Head over to Baugher’s orchards to pick peaches. Between the insulated bags, and my various ice packs, we can do this. Posted in CSA, Farms, Food, Local Businesses and tagged CSA, farms, Food, local businesses, Locavore, real food, wine. Bookmark the permalink. Maryland. My home state. Not really north or south. Depending on where you live, we can be dismissed as being the opposite. New Englanders call us Southern, for being south of the Mason Dixon Line. Those from the deep south call us Yankees. For me, I think it means we can embrace the best of the cuisines from both sides of that imaginary line. My family is German. We can do the whole scrapple, sauerbraten, head cheese, wurst thing, no problem. Still, we also love distinctly Southern tastes. Smithfield ham. Hominy (not far from grits). Biscuits. Fried chicken. Oysters. Shrimp. Blue crab. Finding a cookbook that celebrates the South. In a good way. No, beyond that. In a celebratory way. That would be a great thing to add to my capabilities. I am truly enjoying cooking from Deep Run Roots. My kind of Southern cooking and more. Not drowning in butter, but using those fresh ingredients that grow so well in the temperate climate. I am also discovering just how much my Amish (Pennsylvania Dutch) CSA has embraced and delivered the better heirlooms from the Southern food world. Things like collards, sweet potatoes, grits, cornmeal, okra, turnips. I have made some interesting meals from this book. Mostly using what I get from my CSA. North meeting South. 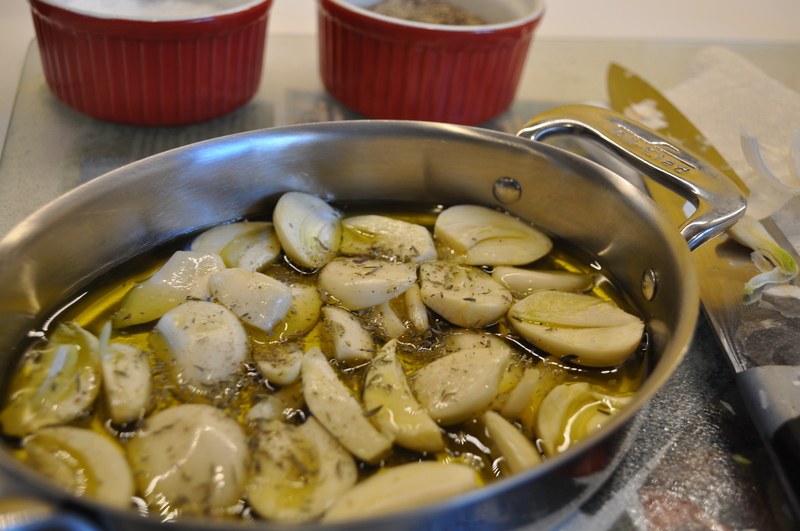 Garlic confit to use in many meals. 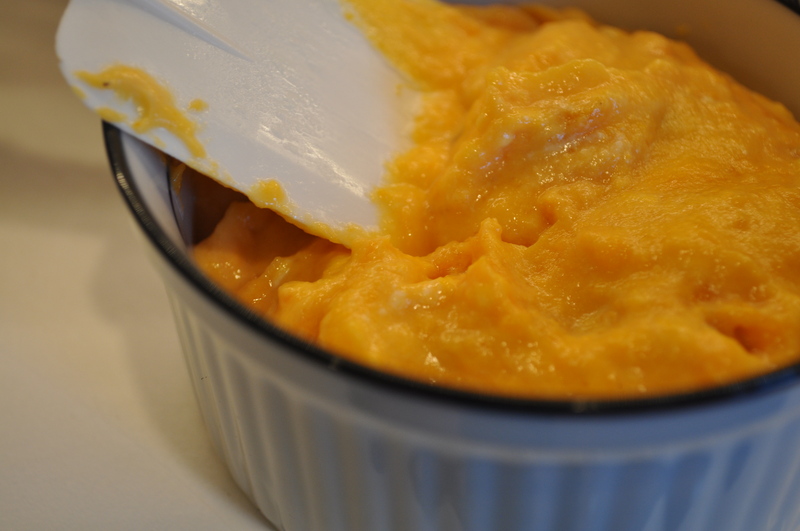 Sweet potato yogurt (OK, this stuff is awesome, I could put it on cardboard and eat it). 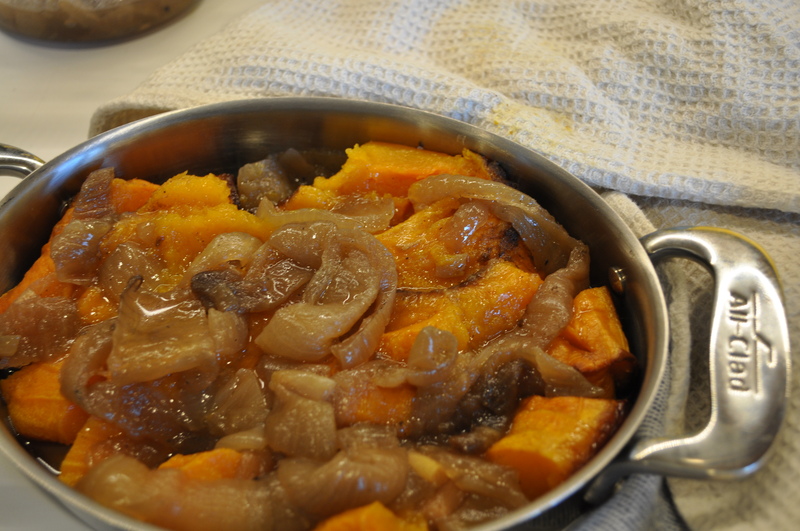 Squash and onions that ended up as a hummus substitute. 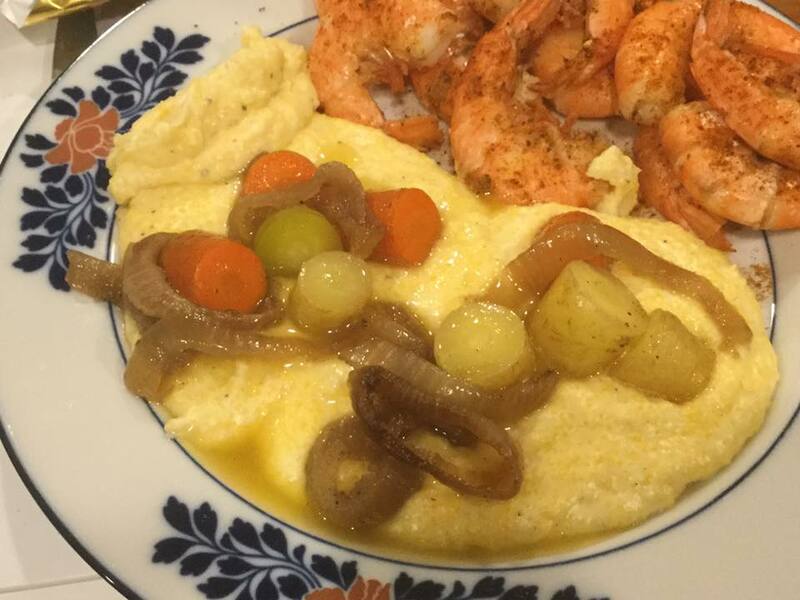 I have also learned how to perfect my grits. Using a double boiler method. A few other things, too. More on those in the future. If you want to try something new with your spring CSA, you might want to download Deep Run Roots. I can highly recommend it. And nobody is paying me to say that. If you want to make something awesome, try the sweet potato yogurt. Roast a few sweet potatoes. Scrape them out of their skins. Equal part of a Greek style yogurt. Honey, lemon juice and salt, to taste. Whirl it all together. Slather it on anything. Sprinkle a little cayenne on it to spice it up. Vivian’s recipe puts it under Collard Green dolmades, made with homemade sausage. I will probably make the dolmades some day, using Boarman’s sausage, but that picture above, with the Merguez sausage from Evermore Farm, that shows you how this base of taste can tame the spice and bring intense flavor to your dinner. Posted in cookbooks, CSA, Food, LFFC, Locavore, Real Food and tagged cooking, CSA, farms, Food, foodie, Locavore, real food. Bookmark the permalink. I promised myself I would try and blog at least once a week, but life keeps getting in the way of writing. This week I finally sat down and cleaned up all my pages. Some of them hadn’t been touched in two years, but now, hopefully, no broken links and no outdated information. What is new? I visited a new to me farm in Carroll County. 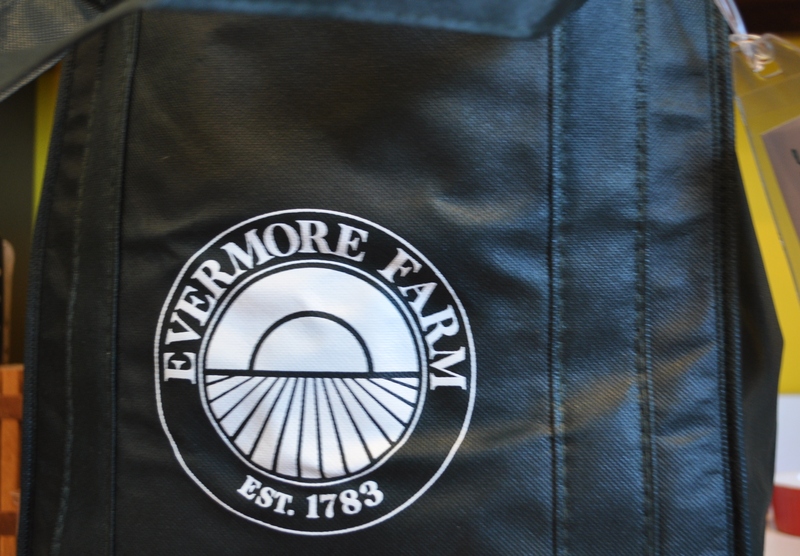 Evermore Farm. According to the owner, Ginger Myers, the farm was once part of the vast Charles Carroll’s holdings, established in 1783. 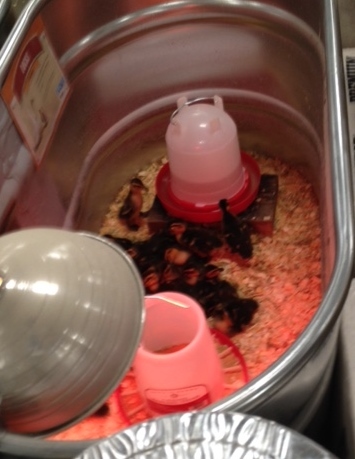 Their farm store is located on the property, which is just southwest of Baugher’s Restaurant and Market, off of Rte. 31. I went up there specifically to get Rheb’s Candy for Christmas presents. I saw a video of the store. I bought some eggs and lamb while there. A good source for grass fed beef, too. And Freedom Ranger chicken. Heritage pork. If you want to fill your freezer, they sell many varieties of packages. I am partial to their lamb package. 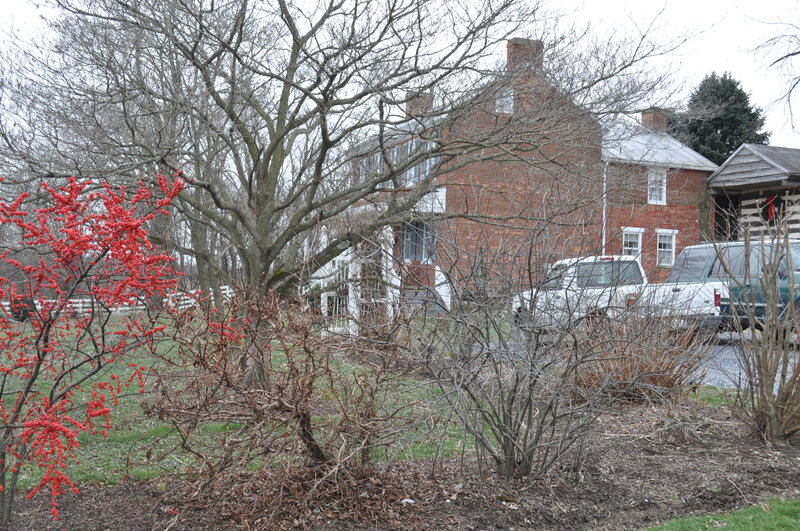 Head out Main Street in Westminster and keep going west on Uniontown Rd to Rockland, a left turn to the farm. 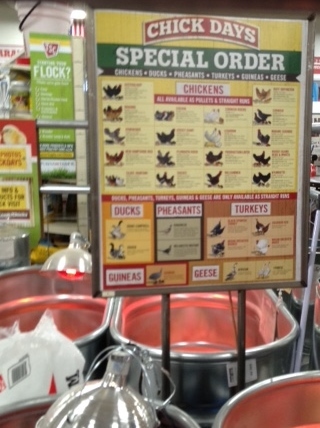 I am seriously considering using their CSA program for meat, chicken and eggs. As for other updates around here, I added some services and changed some restaurant information on my HoCoBiz page. I want to commend Chandler’s Collision Center in Columbia for the outstanding work they did on my car, which was a casualty of a hit and run in a parking lot. Who knew that a daytime running light assembly cost more than my first car? Yep, someone backed into my car while it was parked at Royal Farms, and left my light assembly smashed. A new assembly and a paint job on the scratched bumper, and it looks like new. Chandler fixed our old Jeep twice, after front end damage. They are absolutely the nicest people and their work is guaranteed for “life”. Right now, they are so swamped they are only taking insurance work and the backup time is at least two weeks. We were lucky that our car wasn’t damaged enough to make it undriveable, so we just waited 10 days to put it in there. They told us they are seeing a very large amount of deer-car damage. It’s one of the main causes of the body damage they are repairing. We know to be careful out here, but it is almost inevitable that an encounter will happen to most of us living here. If you need your car repaired, contact Chandler. Other than car repairs, house painting, and bird watching, we seem to be rather settled in for winter. 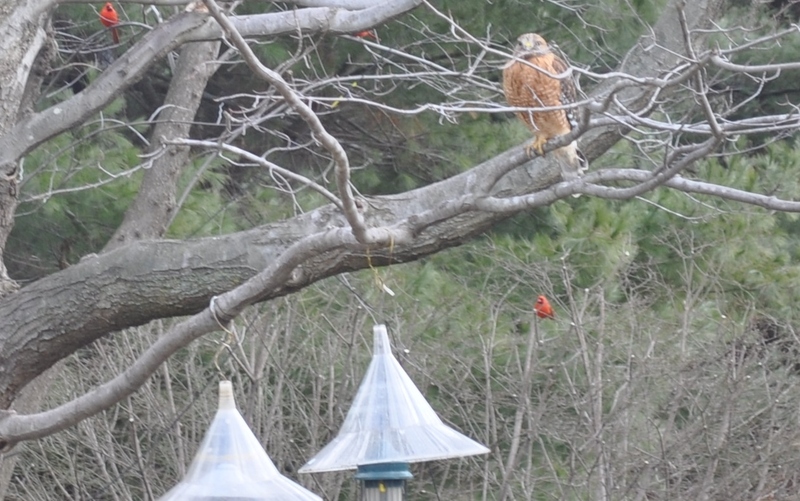 Anyone want to guess whether our new resident hawk will bother the cardinals in the yard? Oh, and as usual, I am still cooking like crazy. Just trying to make it work around all the changes in the kitchen. 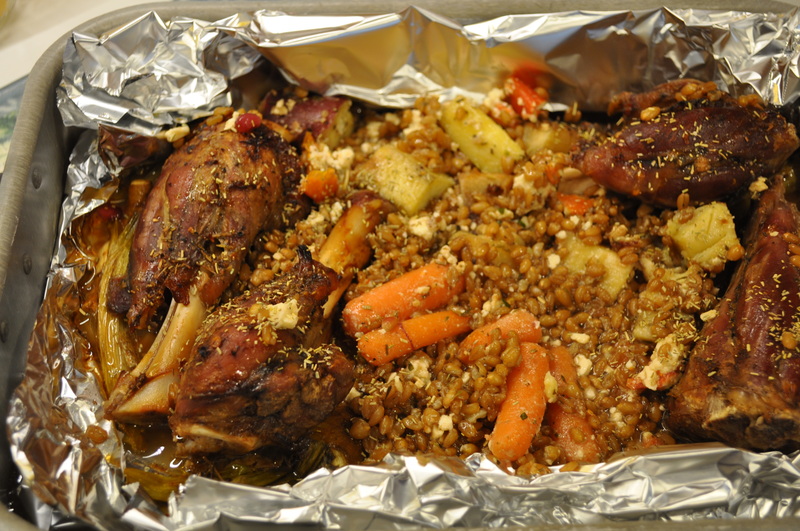 Lamb shanks with spelt berries, parsnips and carrots. It may not be pretty but it definitely tasted great. Posted in Birds, Commentary, CSA, Farms, Food, Local Businesses, Locavore and tagged cooking, CSA, farms, Food, local businesses, real food. Bookmark the permalink.